This post is sponsored by Mott’s. I have a confession to make: a few weeks ago I did something terrible – I forgot to add lunch money on to Anika’s account at school…a few days in a row. My point in sharing my little mistake is that we all goof up sometimes and forget things (sometimes even when we get an automated call from the school the night before!) and you know what? Life goes on. Unfortunately I’m sure she was a little embarrassed, however no harm was done and I think that it is a good thing for our kids to see that we aren’t perfect and that we all are trying our best. With that being said, I know that I’m a busy mom and there are some little things I do to make things like after school snacks and on-the-go meals a little easier for everyone. 1. Keep a snack cupboard. The first thing I do is stock the snack cupboard – I’m not very good at preparing an after school snack every day for the kids, so I don’t worry about it and leave that up to them. They have their own designated snacks cupboard filled with things that they can get without assistance like jerky, crackers, protein bars, and Mott’s® Snack & Go applesauce pouches. That way they have a variety of things to eat that all provide them with some sort of nutrition – the applesauce is convenient because each pouch is a serving, I can keep them in the cupboard vs. the fridge, and they are an excellent source of vitamin C.
2. Freeze Breakfasts ahead of time. I’ve talked about this a time or two before; most days the kids are happy with cereal or oatmeal, but on days that we are running late it’s nice to have something available for them in the car, so I always have breakfast bars on hand and will try to keep frozen breakfast sandwiches or burritos that I’ve made ahead of time that can be quickly warmed up in the microwave. If I’m going to spend any time prepping for meals or snacks, this is the first thing I will do. 3. Make the kids help. Now, I know what you are thinking…this doesn’t make it easier! I know that initially it takes more work to teach your kids to help make a few meals and it does take a greater effort on your part – but what you are doing is making an investment towards more free time later on. Teaching kids to make simple things like grilled cheese sandwiches, oatmeal, and pancakes will not only help them learn responsibility, but can help you later on with dinners too. At least a couple of times a month I have Anika in charge of dinner, and she’ll make waffles or soup and sandwiches, and by spending a little extra time teaching her the way to do things, it’s made life a little easier here and there for Wayne and I. 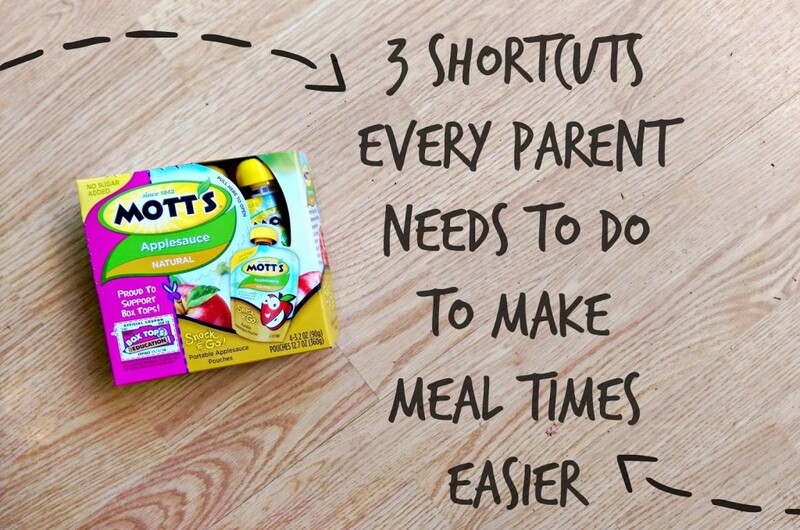 Do you have any shortcuts that help make mealtimes easier for your family? Mott’s® Snack & Go is the nutritious applesauce kids love in a squeezable pouch they can take with them wherever they go. Mott’s is also the only applesauce brand with Box Tops for Education, helping to support kids’ schools. Visit us on motts.com to learn more. of the opinions of Motts®. I really need to do better with getting my oldest son to cook a meal a week. I want to trust him too to cook himself some eggs in the morning. Going to high school next year, they have to be there at 7:15am! We need healthy quick breakfasts! Thanks for sharing with Small Victories Sunday Linkup. Pinning to our linkup board and hope you join us again this weekend.